Yes, I'm talking about man vs. zone coverage again. But this time there's pictures. After watching Courtney Avery play (see the best pass break up of the season above against Bowling Green), you can tell that he was bred to be a cover corner. He may be undersized and a true freshman, but I wouldn't be surprised if Avery ended the season as the starting cornerback across from J.T. Floyd. He brings athleticism and coverage skills that James Rogers doesn't have, but the biggest thing that he's missing is an understanding of zone drops and discipline. 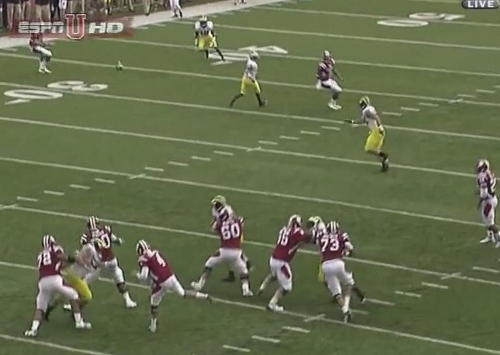 Below is a play against Indiana in which Michigan was using their nickel package and Avery was in the game. 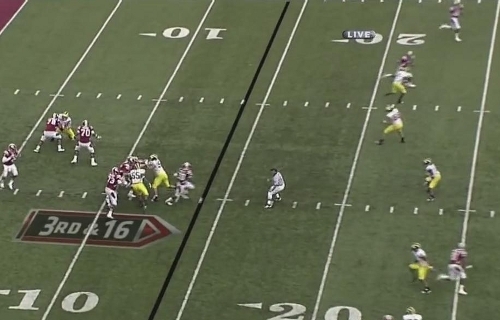 It's 3rd and 16, and a stop on this play could've really swung the game in Michigan's favor. Avery vacates his zone in an effort to play man coverage on one of the slot receivers, creating an easy pitch and catch for Chappell. But watching Avery on the play and throughout the year, it's clear that he was bred to play man coverage. As I mentioned, it's 3rd and 16 and Michigan is in its nickel package with Courtney Avery and Terrence Talbott on the field in place of two linebackers. Avery is lined up near the Indiana slot receiver on the top hash. 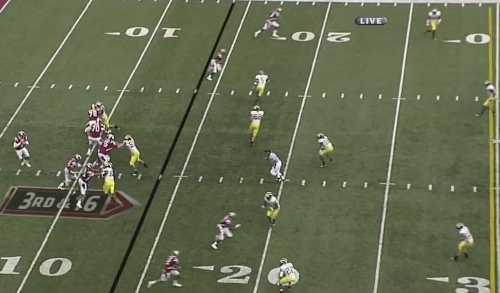 Michigan is playing a cover-3 here with Jordan Kovacs, Cam Gordon, and James Rogers dropping into deep coverage. They rush three and drop the rest of the players into underneath zones. 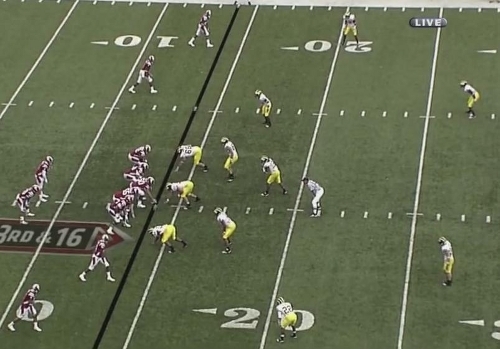 After the snap, you can see Michigan drop into their zones. Avery immediately begins to drop into his zone and head toward the sideline, as does Craig Roh. 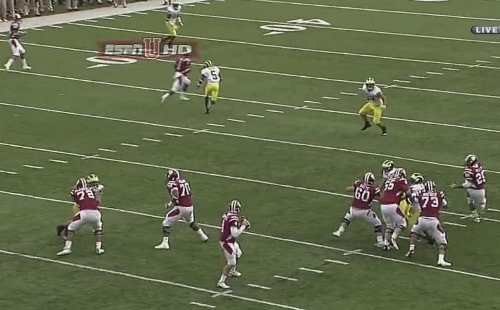 Michigan isn't getting any real pressure with the three man rush and Chappell has all day to sit in the pocket. You can see that all of Michigan's underneath defenders have their shoulders turned toward Chappell and are watching him except Avery who is still carrying his receiver through his zone. The wide receiver to his side of the field is running unabated at Rogers who is covering the deep third of the field. This is a great shot: Roh is staring down Chappell and is sitting in his zone but Avery is still carrying his receiver and has his back turned to to the QB. Rogers, who is at the very top of the screen is in a predicament: he has to cover the deep third of the field, which means he needs to watch both of the receivers in the screen above. As such, the outside receiver has the ability to sit down in the vacated zone with a clear path for Chappell to throw through. In this play, Avery is supposed to turn his shoulders earlier and obstruct Chappell's passing lane to the outside receiver. Chappell has an easy pitch and catch. Rogers doesn't really have the ability to get over there in time but eventually makes the tackle. If Avery plays his zone properly here, this play probably doesn't work out. Despite this being an obviously negative play by Avery, I find it kind of encouraging. Avery is a true freshman and needs to be taught not to do too much--this is what coaches talk about when they say "doing too much". He tried carrying the slot receiver to make sure he didn't get open, but in doing so, he opened up the outside hitch route. Avery is clearly used to playing man coverage and actually does a really good job on the slot receiver in this play, but you can see him making this same mistake a few times during the game: he stays with receivers too long and vacates his zone. If he can start settling in his zone better, he could become a more consistent contributor because, as with the pass break up above, Avery sticks to receivers. I expected Cullen Christian or Talbott to see the field before Avery this year, but at this point, I wouldn't be surprised to see Avery starting alongside Floyd. What if that IU receiver is running a fly route? I'm assuming that Cam Gordon is out there somewhere, but then it's 2-on-2, which favors any offense that also has a 5th year senior QB. Also, if Avery leaves that guy sooner (and you may very well be right that it's a busted assignment) and it is a fly route, then Chappell might have hit him before he even got in Gordon's zone. Its a smaller issue, but Craig Roh doesn't get enough depth here. He's really just covering grass here. 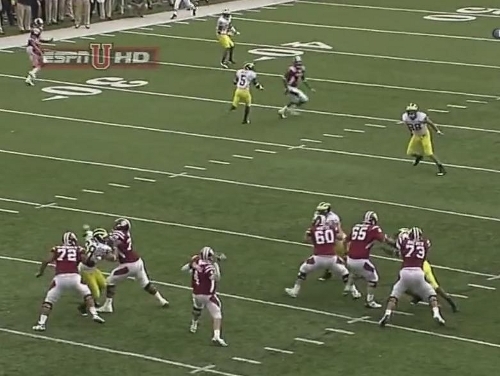 Even if hes worried about the running back coming out of the backfield, that should be Carvin's job in this situation. While he appears to be in the passing lane, he needs to find someone. If Cam's getting taken deep, the Chappell can float the ball over Roh easily. Although zone is not man, this is true, he needs to not cover just a zone of grass. basically, Gordon would have to defend the slot's vertical route and the CB has to take the sideline fly route. Rodgers can help out if the sideline fly shuts down (like it did here) but basically, if you're in cover 3, a well executed 4-Vert can beat you. It's just one of the downsides to playing zone. why is roh in coverage? GErg!!!! !